You should all know I almost published this with “stripped” as the title – but I caught it! Okay I lied – the weekend was less productive then I had hoped and I didn’t get half the things I wanted to finished, Including as set of stays. So that post will go up later in the week, and you’ll be stuck with this one for now. This is another new project I’ve been working on for the last few weeks. It turned out to be way more complicated then it should have been – and I haven’t even started on the part of it I’m interested in making! I was browsing through “The Complete Costume History” and came across this image. I thought all the outfits were interesting, but I was especially attracted to the arming cape and the vests – which almost reminds me of early cassocks. I had several yards of black coating, and under two yards of grey taffeta which I thought looked nice together, and would be perfect for this project. I also had a single yard of black beaded lace, and some buttons I ordered with this project in mind. 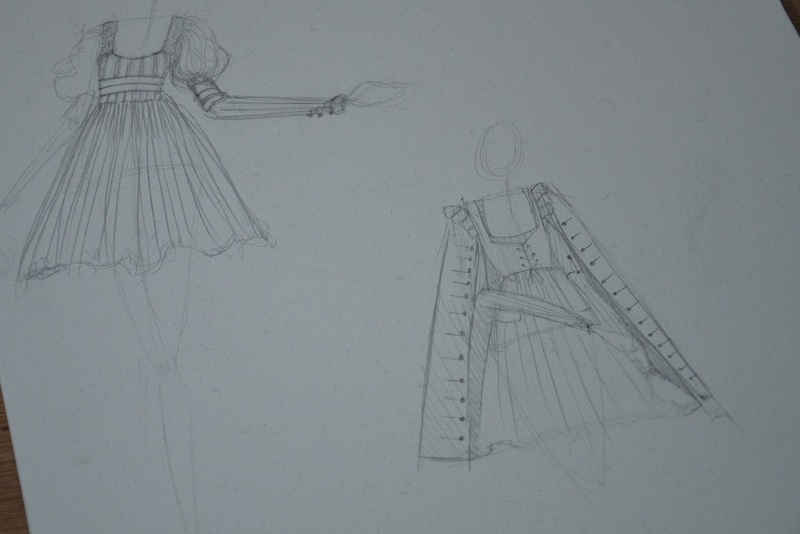 I decided to design a dress to go underneath the whole thing instead of trying to make awkward looking shorts. 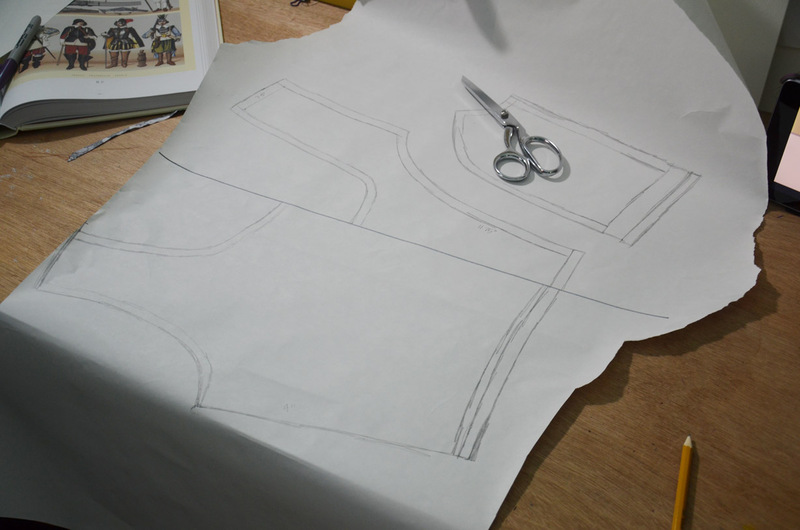 Because the cape is supposed to be the focus there is NO reason for the dress underneath it to be complicated…but I do love complicated dresses, so I decided to make one. It has puffs and stripes and beading and applique, I couldn’t have made this more difficult if I tried. I’m not sure how many posts will be related to this project – it could be as few as three or as many as six. Do you tend to prefer longer posts or shorter ones? Because I could switch to three posts a week that are shorter. 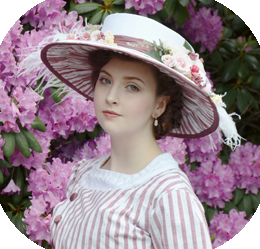 Anyway – this post covers the bodice! I started with a mock up. I actually made another mock up before this one, but it was so terrible I don’t want to harm anyone’s eyes. 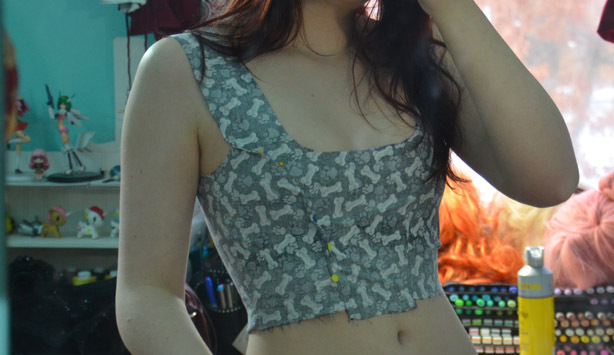 This is a pretty simple five piece bodice, and luckily my mock up fit pretty well this time! 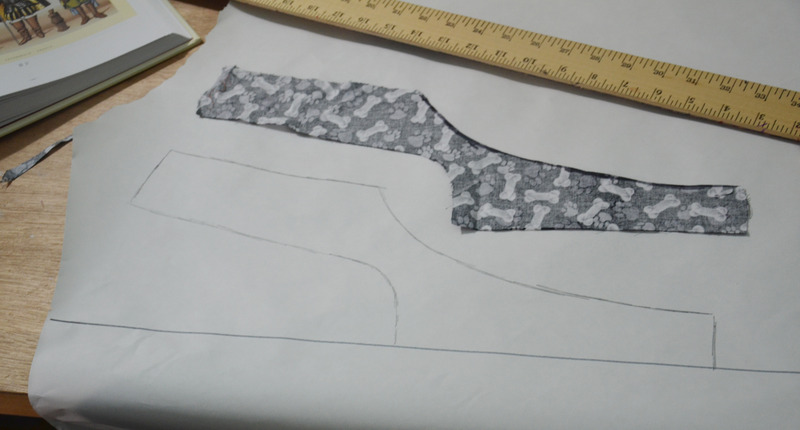 I dissembled the mock up and used it to make a pattern. 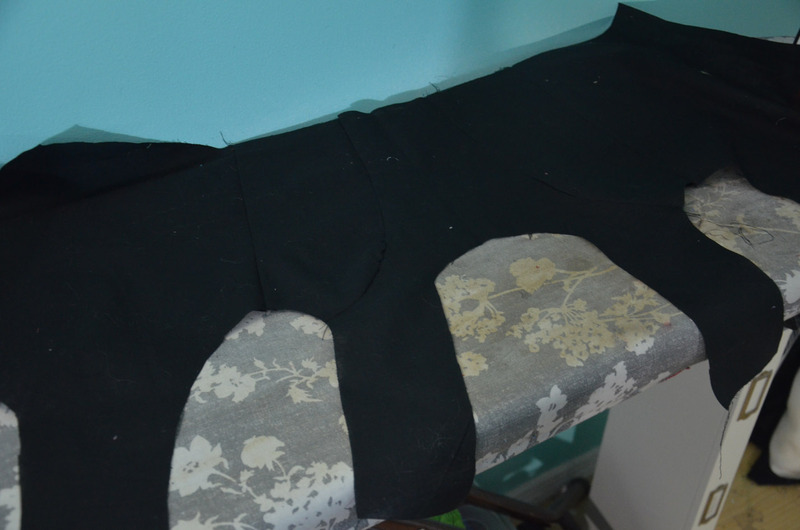 I cut out the pattern once from a black broadcloth, which would become the lining later on. 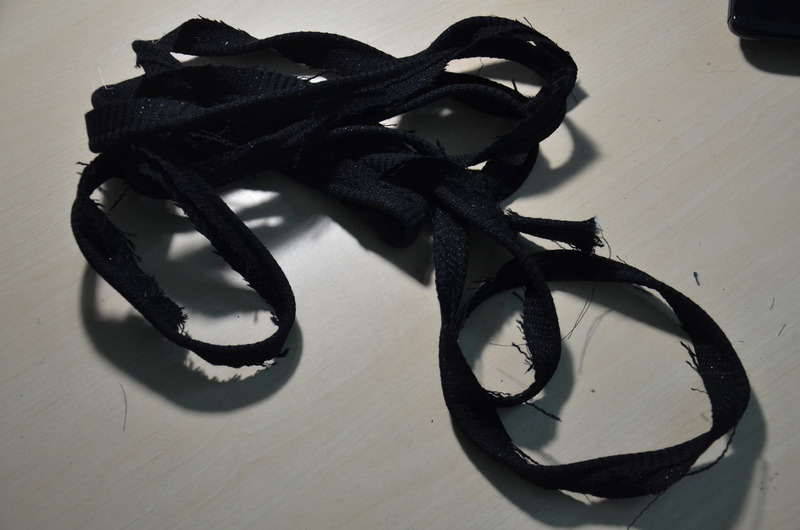 Then I did something kind of strange – I cut the straps off my carefully made pattern. I cut the pattern (sans straps) out once again, this time from the black coating. 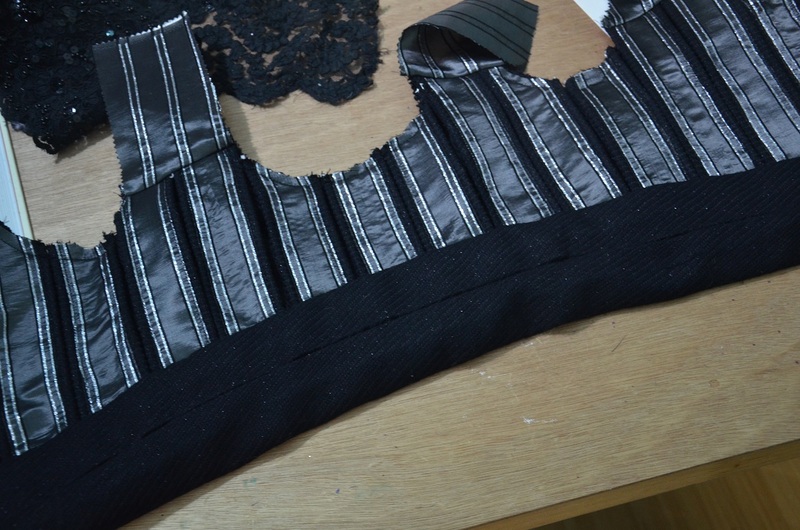 Then it was time to make the overlay of strips for the bodice. 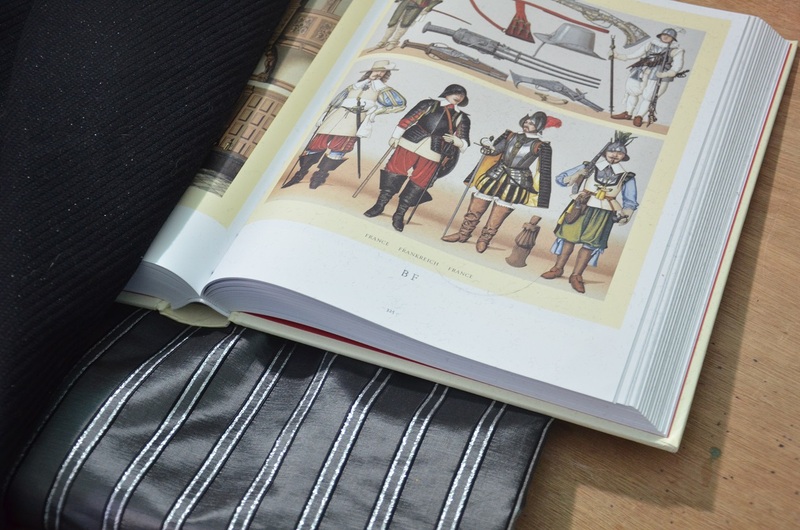 I use my striped taffeta to make this process a little easier. First I cut the strips down to the roughly the right size. Then I folded (and ironed) the edges over so they wouldn’t budge. And made up some piping (out of the coating) to decorate the edges. Then I sewed them together and pinned them to my bodice! 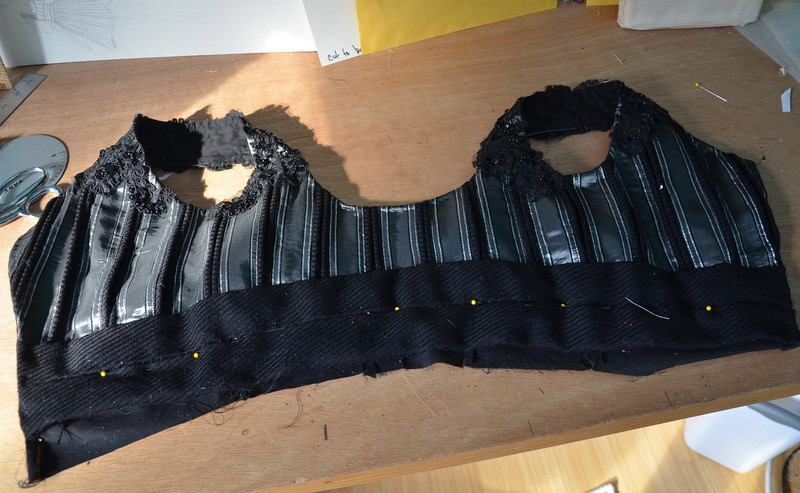 I sewed around the edge of my bodice to hold all the strips down, and set this aside. The next step was making the black bands to go underneath this. These weren’t very difficult, they are just 3.75 inch strips folded over and sewn into a tube. I pressed them so the seam was in the center back of each tube, then I sewed them together by hand. This was ironed, then sewed on to the bodice. 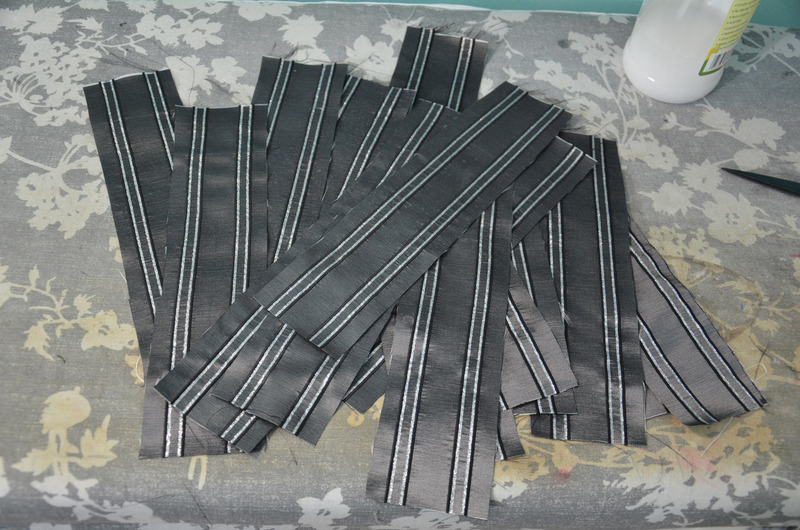 I also took this time to sew on the straps, which are a single layer of striped taffeta. I know they don’t line up at all – which is fine since they will be covered with lace later on. Then the whole thing was pinned (right sides together!) to the cotton lining. 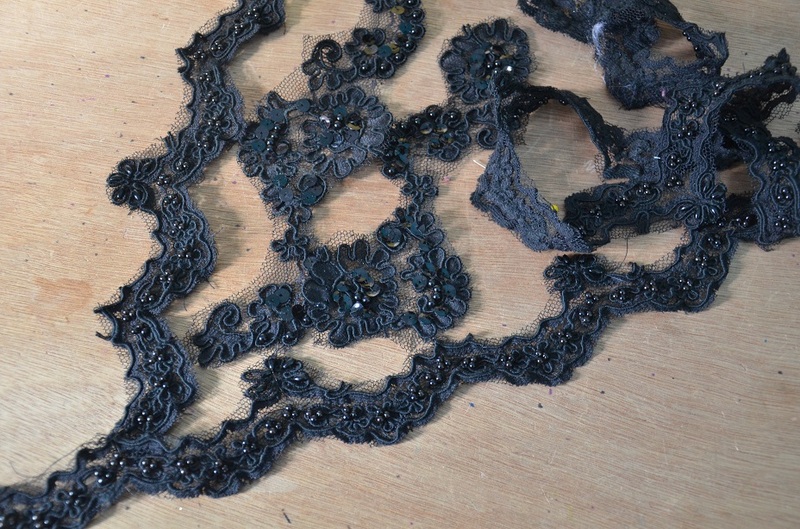 Before that was finished I spent several heartbreaking minutes cutting up the lace. I bought a single yard of this several years ago at a quilting show and really love it. It’s so unusual to see beaded alencon lace in black, since it’s a traditional wedding lace, so I think it was a neat find! I’ve saved it for so long since I was too afraid to cut into it, but it was time. 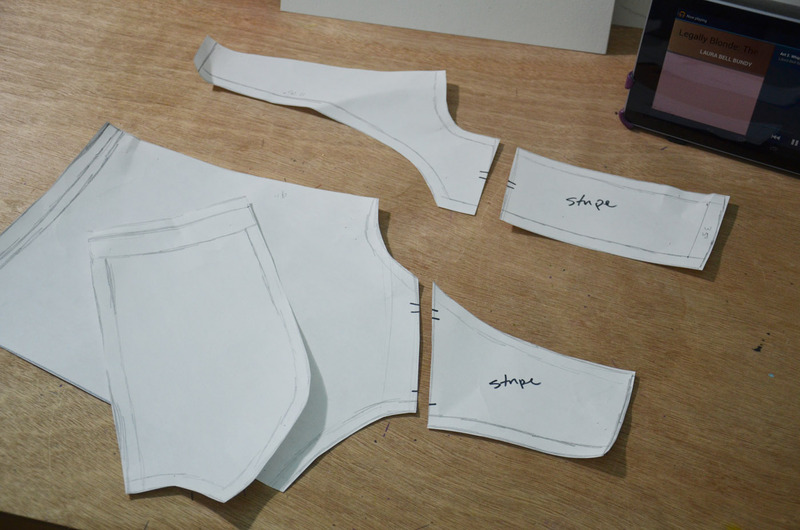 I trimmed the corners and curved edges on the bodice before turning it right side out. 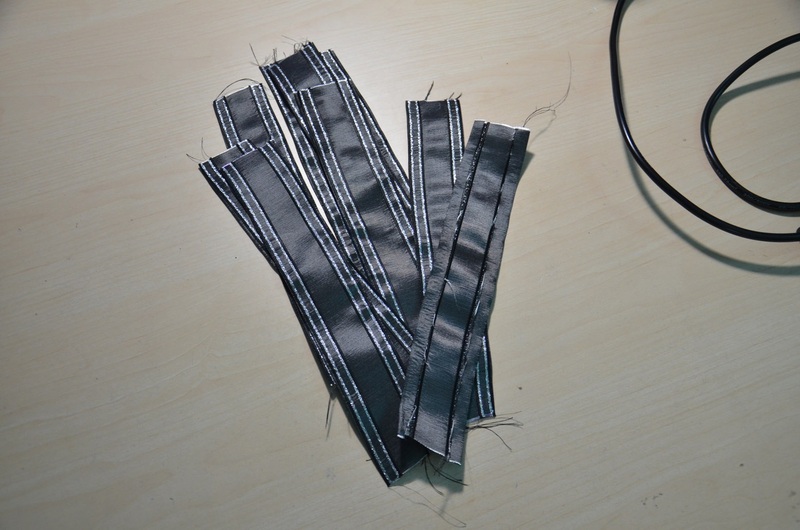 Then I sewed on the lace across the straps, which was much easier then I had expected. 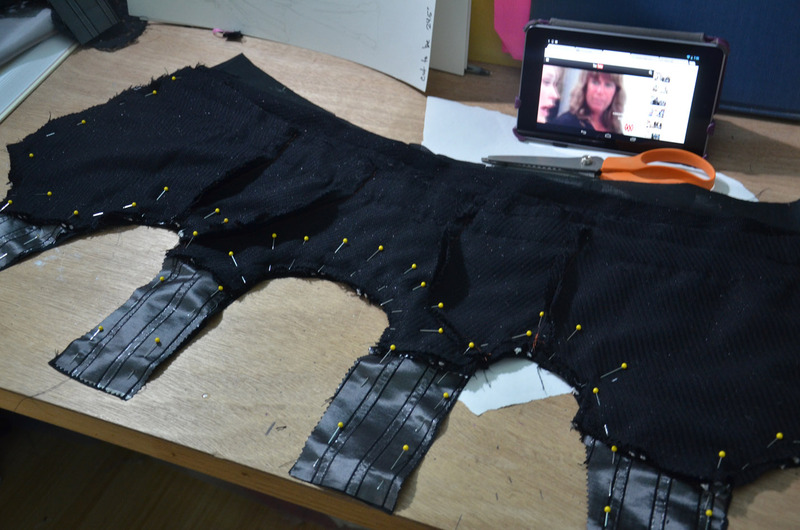 I saved a tiny bit for the sleeves, and the entire scalloped edge for the skirt. This crap photo really doesn’t do the garment any justice, but it’s the only one I took. The better photos are saved for my next post, which will probably be about the sleeves. I really enjoy watching the processes here. Thanks so much for sharing, and I’m interested to see this final project. Question – what do you do with your finished projects? I imagine you have an entire closet of dress creations. Are you able to make an income off of your creations? I’m curious because they are so thorough and amazing. I probably don’t have as many as you think! I have a few dresses hanging up, a few are in bins, and others are stuffed into a tiny closet. Some of my oldest ones have been thrown out. 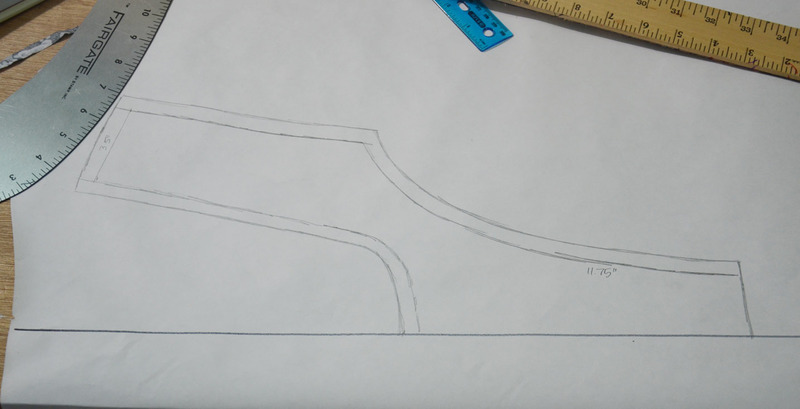 I’m trying to up my construction skills a LOT this year – most of my older costumes are unlined, seams aren’t finished (some aren’t even that sturdy) and overall not made in a durable enough way to be sold. I wouldn’t feel comfortable even giving them away because they really arent done very well at all. So right now it’s a totally non-profit hobby. Thank you very much! That’s right – I remember now you mentioning you’d been sewing for 2 years. You’re talent is incredible. Here’s hoping you can turn a profit for it down the road. Personally I love your posts regardless of length! I’m learning a lot about costuming and sewing, too 🙂 Thank you so much! I just wanted to thank you for taking the time to blog all of this, sewing is something I really want to get good at and your process is the best quality I’ve seen. I’ve already learned so much and can’t wait to learn more! I’ve been a silent lurker, but I just thought I’d drop you a line to say I really enjoy reading your blog, your creativity is wonderful to witness! 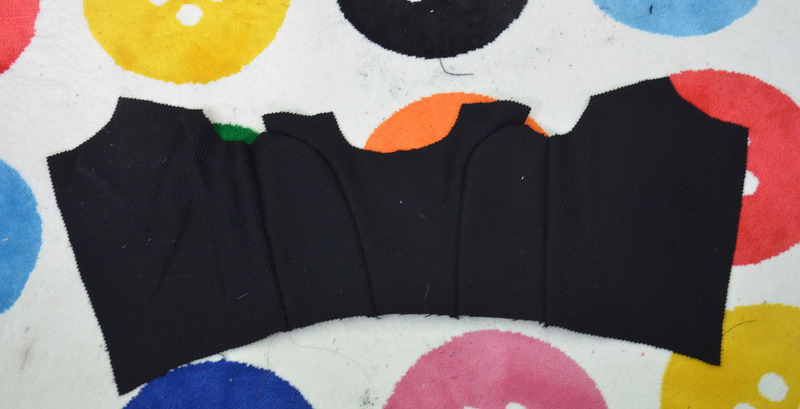 By the way, I saw your tumblr post about not being happy with the skirt part – why don’t you put in inserts of the broadcloth down from the parts where the piping is in the top? It would look like it hte top and bottom match up and it would add the volume that you sketched. And you could always put that lovely lace on the cape? I just found you via pinterest and your frozen costume. I know I am going to enjoy your blog very much. I don’t sew any more than the basics and I am really impressed with your ability to sew and — most of all — your passion! You have found a very special gift in yourself, that’s for sure! I look forward to following your progress as a reader of your blog. Keep up the good work! I must say I am super impressed with how far you have gotten with your sewing skills, you’re quite the inspiration to me to get better at sewing and make better cosplays all around ^^.